As it now seems abundantly clear in this country permanent short term gratification by utilizing "kick the can" policies will have us rolling from one emergency to another over the coming decades. I guess this continues until one day there is no blood left to squeeze but perhaps we can keep the gig going for another 10, 15, 20 years. So we'll continue looking for opportunities outside the borders in responsible '2nd' or '3rd world' countries - Chile appears to be one country with a leadership that actually thinks out past the next 180 days. Found this nugget in the Wall Street Journal - I'll confess this is my first entry about Chile (perhaps I touched on it on some copper pieces in 2007 or early 2008). Let's compare and contrast behavior. As the savings swelled above $20 billion -- more than 15% of Chile's economic output -- Mr. Velasco faced growing pressure to break open the piggy bank. In September, protesters barged into a presentation by Mr. Velasco, carrying an effigy of him and shouting, "The copper money is for the poor people." The 48-year-old Mr. Velasco, wary that a flood of copper income could generate lending and consumption bubbles, stood his ground, even as the popularity of the center-left government withered. (can you imagine?) Latin American history, he cautioned, was full of "booms that had been mismanaged and ended badly." Today Mr. Velasco looks like a prophet. Since the onset of the global economic crisis, copper prices have fallen by 50%, in line with the sharp decline in other commodities. Emerging economies that got too giddy in the good years are now coping with nasty hangovers. Soybean-dependent Argentina is facing a possible debt default while oil-rich Russia has been stuck bailing out banks and companies that got in over their heads in debt. Thanks to Mr. Velasco's caution, Chile is now in a position to try to bootstrap its own recovery from the global recession. Mr. Velasco's preemptive moves have kept Chile's government from having to spend a single peso on bank bailouts. Having paid down foreign debt during the fat years, Chile is now a net creditor nation, with a debt rating that was upgraded by Moody's Investors Service in March. And now Chile is pouring some of its copper savings into a massive stimulus plan, consisting of job-creating public-works projects, tax breaks for business, investments to keep mines operating and other goodies. Chile's plan is one of the largest stimulus packages in the world relative to the size of its economy. The Chilean program is the equivalent of 2.8% of gross domestic product. As a result, economists expect the nation's annual economic output to decline a very slight 0.5% this year, compared with much steeper declines elsewhere. The government is more popular today during the global recession than it ever was during the copper boom years. President Michelle Bachelet has a 67% approval rating, up 25 points since last August. Mr. Velasco, whose job appeared in danger a year or two ago, is as popular as she is. Juan Carlos Huaiquimil, who sells soft drinks from a pushcart, is the head of one of 1.7 million Chilean families, the poorest 40% of the population, which received cash stipends from the government in March. He says the money, equivalent to $70, was a godsend, helping pay for school supplies and uniforms for his three children. Last week, Chile announced another stipend will be paid in August. The answer in emerging-market countries is not many. During the boom in emerging economies that started in 2003, governments that were raking in export dollars from commodities or manufactured goods often paid lip service to the idea of husbanding wealth for leaner years. Countries from Bahrain to Brazil set up sovereign-wealth funds, investment vehicles designed to develop national nest eggs. Governments in Brazil and India are constrained by high debt levels, which drain resources that might otherwise go to stimulus, says Mr. Loser. Indonesia's government is hamstrung by local capital markets that are too small to fund the government, he says. Mexico hasn't much room to boost spending partly because the government funneled more income from the good years into current expenditures than into the country's sovereign-wealth fund, economists say. Chile, which has long been a laboratory for economic experiments, had its thrifty fiscal consciousness forged by a national tragedy in the 1970s. To finance his plan of turning Chile into a socialist state, then President Salvador Allende cranked up the money presses, leading to inflation of more than 500% and alienating the middle class. The societal stresses came to head on the morning of Sept. 11, 1973, when Chilean air force planes bombed the presidential palace in a coup by Gen. Augusto Pinochet. Mr. Velasco studied economics at Columbia University, as part of what he calls a quest "to understand how did this happen [to Chile] and how do we make sure it will not happen again." The conclusion reached by Mr. Velasco and other economists of Chile's left was that runaway inflation had made Chile fertile ground for coup plots, and that political stability couldn't be ensured without financial stability. Taking that lesson to heart, the Concertación administrations that governed Chile after the country returned to democracy in 1990 produced budget surpluses in all but four years over the next two decades, Mr. Velasco boasts. They also preserved the Pinochet government's pioneering free-market economic reforms, including personal social-security accounts and privatization of public companies. When Mr. Velasco left a professorship at Harvard University to become Ms. Bachelet's finance minister in 2006, he took office amid a historic surge in copper prices. When commodities are high, Mr. Velasco says, "a country seems very creditworthy, everyone wants to lend to you, capital flows in and consumption booms." But at such times bubbles in banking, real estate and consumer spending can easily inflate, he says. Meanwhile, dollar earnings from commodities can make the local currency grow too strong, hurting the competitiveness of manufactured exports. All of that makes the economy vulnerable to a crisis when the commodity falls, as Chile learned during the last copper crackup in the early 1980s. To avoid repeating history, Mr. Velasco in 2006 pushed through a law requiring the annual budget to be based on an independent committee's estimate of the average copper price over the next 10 years -- not on the current market price. Any copper income above the budgeted price goes into a savings fund maintained outside the country. In 2007, the copper price used in calculating the budget was $1.21 a pound, while the actual market price turned out to be $3.23 a pound. The windfall profits -- some $6 billion -- went into the savings fund, invested conservatively in government bonds or money-market instruments denominated in dollars, euros and yen. 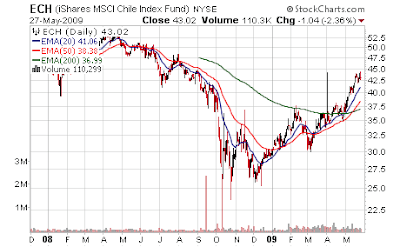 But a poll taken in May of 2006 revealed that two-thirds of Chileans wanted to spend the copper windfall, not save it. (so doing what is popular and fun in the short run is not the correc thing sometimes? My mind is spinning - how do you guys buy voters allegiance down there with this sort of thinking?) The Bachelet government increased spending at an 8% annual rate, expanding pension coverage and the day-care system. That wasn't enough to satisfy a populace with rising expectations. Mr. Velasco's policies came under fire from within his own coalition, which feared being voted out of office. "Are we going to hand over to the Right a government with $20 billion or $30 billion in the till?" said Sen. Frei, who served one term as president in the 1990s. "That is crazy." On top of everything else, Chile's economic performance was lackluster. In mid-2008, Chile recorded its most anemic growth in six years, while inflation was picking up steam. Conservatives said that was part of a broader pattern of economic decline, in which Chile's annual economic growth had averaged around 3.7% during the prior 10 years, half of the level of the decade before. Chile is putting $700 million into a huge infrastructure program designed to create at least 60,000 jobs in road paving, airport upgrades and housing construction. The home-building plan, which features subsidies for middle- and low-income buyers, has prompted developers to start clearing land for a 400-unit development called Western Gardens not far from Santiago's airport. And look ma, we did it without borrowing from the Chinese. Or in completely banana republic style - from our own Treasury via our central bank.